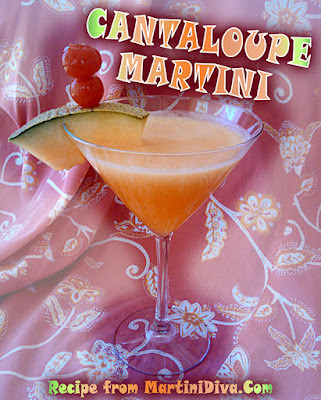 It's the time of year that decent, fresh cantaloupe starts showing up in the market and there's nothing better than a fresh cantaloupe cocktail in the heat of summer to cool you off. If your cantaloupe is ripe and sweet there's nothing more refreshing. If your cantaloupe has almost gone overripe it's even better for the cocktail as you get more juice and much more sweetness. DIRECTIONS Using the melon baller, scoop out several cantaloupe balls for the garnish and set aside. Chill your glass in the freezer. Add the warm water, honey and lime to your cocktail shaker and stir to blend the honey into a syrup. Fill the cocktail shaker with ice, add the remainder of the ingredients and shake until chilled. Pour into the chilled glass, garnish and serve. If you prefer, you may strain your cocktail through a metal strainer for less pulp from the puree. If you like cantaloupe in your cocktails you might also like my Cantaloupe Daiquiri. 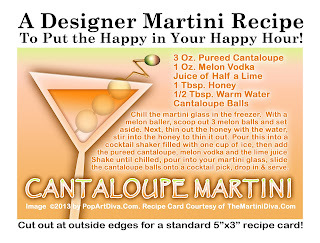 You can purchase the Cantaloupe Martini on Recipe Cards HERE.